UK Department of Theatre and Dance brings the troubled pasts of the Magrath sisters to light onstage with its production of "Crimes of the Heart." The play will run Feb. 14-17, at the Briggs Theatre. 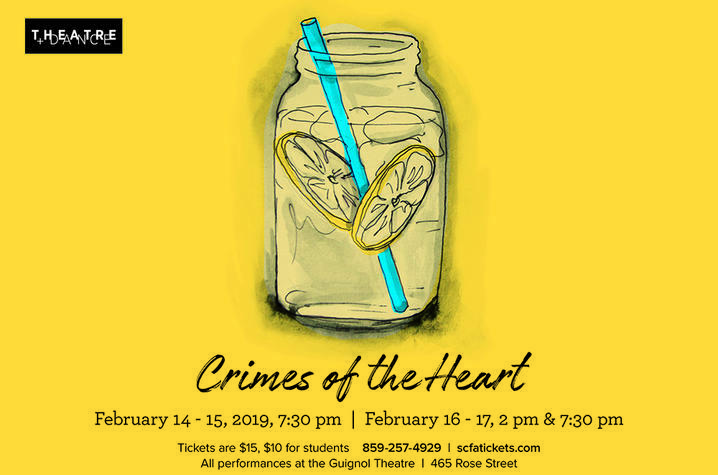 LEXINGTON, Ky. (Feb. 4, 2019) — The University of Kentucky Department of Theatre and Dance will bring the troubled pasts of the Magrath sisters to light onstage with its production of "Crimes of the Heart." The play will run Feb. 14-17, at the Briggs Theatre, located in the Fine Arts Building at 465 Rose St.
Hailing out of Hazlehurst, Mississippi, the three Magrath sisters, Lenny, Meg and Babe, had a troubled childhood. Now, as young adults with relationship issues and failed careers, these sisters remind the audience of the importance of family. After all, blood is thicker than sweet tea. Audiences can fall in love with Beth Henley's "Crimes of the Heart" 7:30 p.m. Thursday and Friday, Feb. 14-15, and 2 p.m. and 7:30 p.m. Saturday and Sunday, Feb. 16 and 17, in the Briggs Theatre. Tickets are $15 for general admission and $10 for students with a valid student ID at the ticket office. Processing fees and sales tax will be applied to the ticket purchase. Tickets can be purchased at the Singletary Center for the Arts box office, by phone at 859-257-4929 or online at www.scfatickets.com.